Importance and Significance of Mangalsutra – Sampat Jewellers Inc.
Mangalsutra or “mangalsutram” evolved from a Sanskrit term ‘mangal’ means prosperous, blessed, happy, successful and ‘sutram’ meaning cord. Ideally, a mangalsutra is made of 108 (an auspicious number) fine cotton threads twisted together and dyed yellow in saffron or turmeric. On the thread, a gold thali is strung in the center. During the wedding ceremony, the priest recites mantras (chants) when the groom ties the mangalsutra around the bride’s neck, securing it with three knots. This act of tying a mangalsutra signifies the groom and the bride are united and have a responsibility of taking care of each other. The mangalsutra is regarded as an auspicious amulet and the bride herself is said to be auspicious (sumangala). By wearing the mangalsutra, the bride is said to become immune to the evil eye. By extension, anyone who sees her is automatically granted good luck. Mangala is also the name of the planet Mars, whose color is red, same as the auspicious garment color worn by Hindu brides. Because of this association, it’s common to use coral gem (manga) that is sacred to Mars. Mangalsutra chain is made of black glass beads (kala pota). It’s said to repel the evil eye. There are four primary reasons for wearing a mangalsutra. The mangalsutra is the symbol of the bond of union between Shiva (husband) and Shakti (wife). Basically, it’s an inseparable bond between the husband and the wife. Married women are expected to wear the mangalsutra throughout their lifetime and it is believed to enhance the well-being of her husband and family. The three knots ties represent important aspects of marriage. The first knot represents her obedience her husband, the second knot signifies her commitment to the husband’s parents and the third knot represents the respect for the God. Mangalsutra is usually a black beaded chain in the thin wire of gold. The gold wire and black beads are supposed to destroy the distressing vibrations. The black beads absorb the negative energy before they can reach the bride and her family. Basically, the mangalsutra acts as a protective sheath around a woman’s body and protects the marriage from any evil. In this section, we’ll discuss the thought behind every key element of a mangalsutra. This is “how” and “why” on the elements of a mangalsutra. The chain length of a mangalsutra traditionally was long enough to reach the bride’s Anahat Chakra, meaning Heart Chakra located in the center of the spine, near the heart. This means ideal chain length should be at least 24-30 inches long. Anahat Chakra also means infinite sound and is associated balance, calmness, and serenity. Sometimes you may see small gold cup-like pendants. These are known as vatis. Many cultures tend to choose this as a universal mangalsutra pendant. Your mangalsutra can either have one single vati or two vatis. Maharashtrians and Tamilians prefer two vatis. The dome-shaped spherical vati is used because of its ability to emit maximum waves in comparison with other shapes. The vatis face the Anahata-Chakra. This helps in the dissolution of a woman’s negative emotions such as her ego. 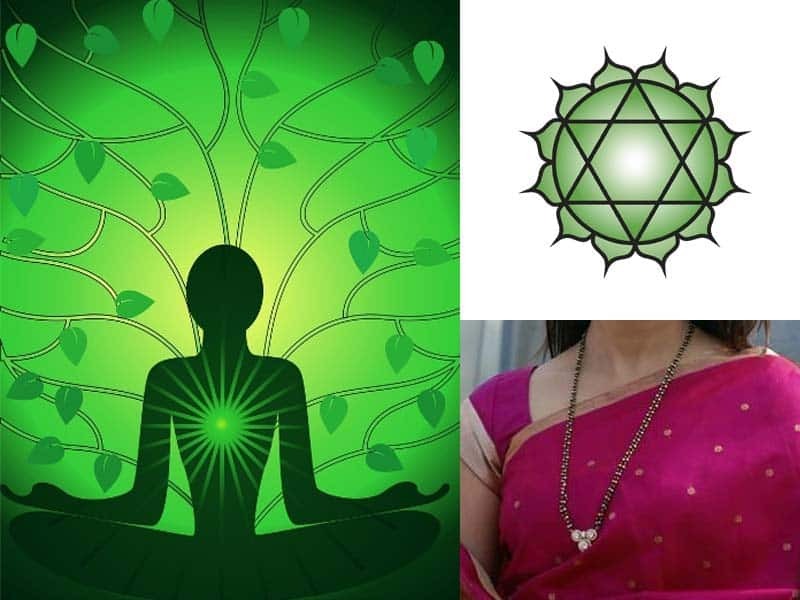 The vati typically does not design on its surface because it is believed that the positive vibrations will be obstructed due to any additional design. For the even higher level of positive vibrations, two spherical gold beads are placed between the vatis. A flower pattern at the top of each vati is for attracting positivity in term of material possessions. In a typical mangalsutra there are two strings of black beaded chain and according to Hindu dharma, they represent a union of Shiva and Shakti. Although mangalsutra is a prominent wedding ornament, there are other types of wedding jewels. A wedding ornament symbolizes that a woman is married and comes from a certain cultural background. Wedding jewelry in many ways is an entry into the dynamics of Indian society. It’s an integral part of the relationship between a man and a woman. Like many cultures around the world, Indians have devised and widely adopted a wedding ornament. Women and sometimes men, wear wedding ornaments to indicate they are married. In the Northern parts of India, marriage ornaments are mostly worn in head, nose, wrist, and toes. In Southern parts of India, marriage ornaments are worn suspended through the neck. The basic function of the ornaments is to ward off negative effects of evil spirits and protect the wearer. Kashmir: Dejharu is a pair of gold pendants that pass through the hole in both ear and fall far below shoulder level to rest on the chest. This unique ornament is given by a father to his daughter at her marriage. Uttar Pradesh: Bulak is a large circular gold septum ring. Punjab: Tikka is a forehead ornament worn at the central hair parting. Gujarat: Ivory, gold, glass bangles and silver toe rings. Rajasthan: Gold nose stud (Laung), Glass bangles (Churi), toe rings, gold or silver belt with jingling chains (Kandora, Kardani). Maharashtra: Mangalsutram is a necklace of small black glass beads with a gold pendant, gold wire nose ring set with pearls, rubies, emeralds and sometimes diamonds. Tamil Nadu: Gold thali is a small gold pendant worn around the neck. Kerala: Nagapadathali is a gold necklace consisting of many units of the same design such as serpent heads. A gold thali may be incorporated into this and can be worn separately as well. South Indian Christians: Gold bangle and a gold thali but bearing a cross on it. Today the term thali, sometimes spelled as tali, is a gold marriage ornament. It is especially common in southern India, but it’s gaining acceptance in other parts of the world. The Sanskrit word Thali is derived from the vernacular name of the Palmyra palm, Thala Borassus flabelliformis or a large-leafed talipot palm and thali pat: Corypha umbraculifera both common in south India. Originally it was a part of the custom to tie a string on either of these palm leaves around the neck of married women to indicate her married state. Eventually, the customs were transferred into the gold ornament. A thali can be made in many different forms and in any size. It basically bears the representation of various gods and goddess of good fortune. In addition to these wedding ornaments, it is a common practice for many Hindu women to place a red pigment known as Sindoor, Shangraf, or Kumkum in the parting of the hair near the forehead. This red pigment symbolizes the union of Shiva and Shakti and also indicates that the married woman’s husband is still alive. What Happens if Your Mangalsutra Breaks? If a mangalsutra breaks some people believe it’s bad luck but in reality, it is just an accident. This may occur due to many reasons like wearing it at night time, handling it aggressively or if the piece is not made properly. So don’t blame it on the bad luck or evil. Mangalsutra is there to protect you from evil and not the other way around. Even though there are some women that never remove their mangalsutra, there are married women in the cities who have a professional career and don’t like wearing traditional Indian jewelry at work including their mangalsutras. For them, in order to satisfy their lifestyle, smaller petite and modern designs are created by many jewelers. We at Sampat Jewellers also specialize in versatile simple mangalsutra designs that a modern bride can enjoy. Thus you may see many variations of the concept of the mangalsutra that we discussed above. It’s completely fine to wear something that you believe in and it makes you feel beautiful. This will automatically attract positivity in your life. How to Choose a Perfect Mangalsutra?